The paper surveys results of V. Maz’ya in the linear theory of water waves. All main topics of his work in this field are considered. 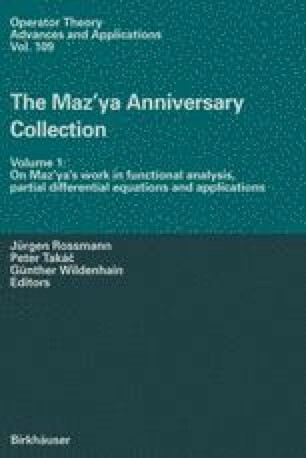 At first, we describe Maz’ya’s achievements concerning the tough question of the unique solvability of two steady-state problems, which are: (1) the problem of time-harmonic waves in a layer of variable depth, and above a totally submerged body; (2) the problem of wave patterns due to the uniform forward motion of a body in water of constant depth. The review ends with a description of asymptotic expansions for unsteady waves arising from brief and high-frequency disturbances. A complete list of Maz’ya’s publications on water waves is given.